Squash House Quilts: Class Photos! Most of you know that I am a Supreme Pattern Tester for Stephanie over at Loft Creations. Last spring I tested Barefoot in the Park for her and the past two weekends I've taught the pattern at my local quilt shop! 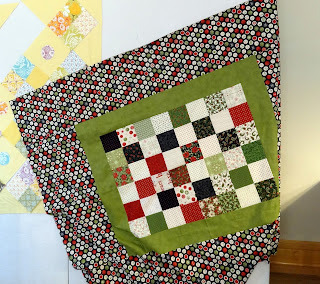 Mary Jean wanted to make hers in the same Kate Spain "Central Park" fabrics. You can see her progress here on the left. Rhonda made two versions! The first one next to Mary Jean's is a mixture of Sweetwater's Countdown to Christmas and another line (sorry but I've forgotten the name of it). Here is the back of Rhonda's first version. This is Rhonda's second version from BasicGrey's Jovial line. 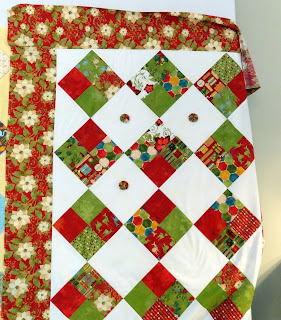 Instead of appliqued circles on this one, she decided to try yo-yo's! Here we were playing with one or three and she decided she might just make one larger yo-yo instead. I just love the differences in each wonderful version! Rhonda and Mary Jean certainly didn't need me much as they were both excellent quilters! We had a great time chatting and sewing! Well that's fantastic and actually, no, I didn't now you were the Supreme Pattern Tester for Stephanie the Kind nor was I aware you taught classes which I think is spectacular and a great way to give back!!! I can totally see you doing that. I admire the teachers among us. Not everyone has the ability. You're worth your weight in Gold. :) *karendianne. Isn't it fun to see different versions of the same pattern - it really changes the look. It looks like this class was definitely a winner! What fun to be able to test their patterns,....love them. 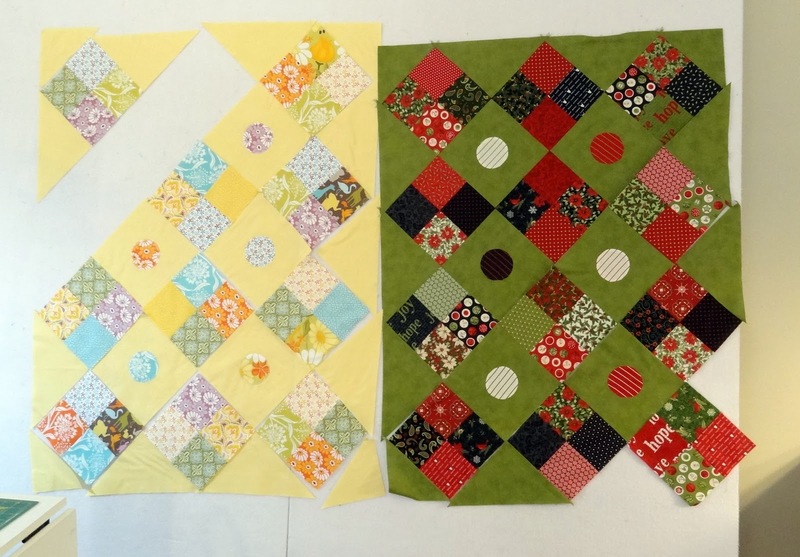 The different colourways give the quilt a totally different feeling. Good luck with your class! What a great day of sewing you shared--I'm sure your students loved all the extra visiting and stitching. 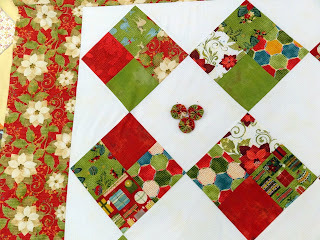 I just purchased this quilt pattern from Stephanie along with String Beans. Can't wait to get started on versions of my own! So neat to see Barefoot in the different versions! I bet you are the best teacher EVER!! Hey Teach! You must be good at this. Your students obviously listen to you!